The New Testament contains a vocabulary of 4,800 words. The New Testament focuses more on the life and teachings of Jesus and the Christian church. The Old Testament explains the history of the creation of the World, the exodus of Israelites, and the Ten Commandments given to Moses by God. The New Testament is the second major division of the Christian Bible. Old Testament is the first division of the Christian Bible. What you have to do to be forgiven? All you have to do is to repent and you're forgiven automatically. You have to bring a lamb as a sacrifice for your sin to be forgiven. Trinity of God. (God the Father, the Son and the Holy Spirit. God (YHWH/Adonai) will send a messenger to bring salvation on earth. The Old Testament is the first division and the only source for the history of Israel and Judah, the earliest material dates back to 12th century BC. The Old Testament is similar to the Hebrew Bible and varies primarily in the order of books. In the Old Testament the Book of Malachi is placed last whereas in the Hebrew Bible the Book of Chronicles comes last. The Greek translation of the Bible, known as Septuagint, forms the basis of the Orthodox churches as well as Eastern Old Testament. The Latin translation of the Septuagint known as the Vetus Latina originally formed the basis of the Old Testaments in the Western churches, and was later replaced by Jerome’s Vulgate. Protestant churches follow the Biblia Hebraica Stuttgartensia. The first record of the New Testament - Ryland Library Papyrus P52, is found dated between 117 and 138 A.D. The original texts have been written by various authors in Koine Greek. Later these books were made into a single volume and consist of a twenty-seven book canon or set. The Old Testament is written with a vocabulary of 5,800 words whereas the New Testament is written with a vocabulary of 4,800 words. The contents and order of books of the Old Testament varies in different churches. The Orthodox communion has 51 books and the Protestant communion has 39 books. The books include the Codex Vaticanus, Codex Sinaiticus, Codex Alexandrinus and Peshitta. There are books of poetry, thanksgiving, wisdom proverbs and prophets. The New testament may contain additional books such as Tobit, Judith, Wisdom of Solomon, Wisdom of Jesus Seirach, Baruch to name a few, and also some additions to other sections of the Bible. The New Testament contains the gospels, which are the four narratives of Jesus' life and death, narratives of the Apostles' ministries, epistles which are twenty one early letters written by different authors, and an Apocalyptic Prophecy. These books focus on the life of Christ, his teachings and also a book of prophecy that predicts the end of time. The Old Testament provides the basis of the present day Judeo-Christian faith. It talks about the history of how the world was created, exodus of Israelites, and the Ten Commandments given to Moses by God, and also includes real life stories. The function of this text is to teach people through the experiences of people throughout history. Several books also foretell the arrival of the Messiah and the end of the world. The New Testament, on the other hand, focuses more on the life and teachings of Jesus and the Christian church. The stories are narrated through gospels and emphasize the importance of the sacrifice of Jesus. The function of the New Testament is to lead people to follow the example of Jesus more closely. The other books, written by various authors also talk about the end of the world and last battle between good and evil. 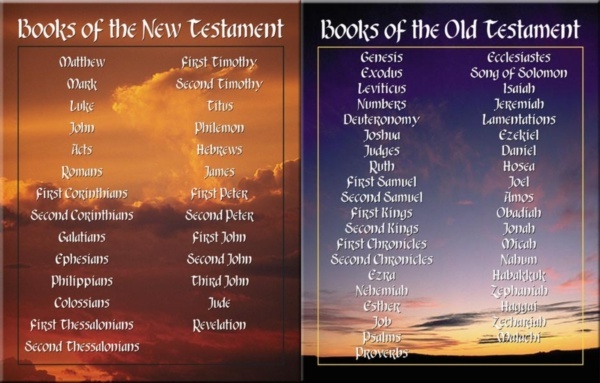 While the Bible is a unified book, there are differences between the Old Testament and the New Testament. In many ways, they are complementary. The Old Testament is foundational; the New Testament builds on that foundation with further revelation from God. The Old Testament establishes principles that are seen to be illustrative of New Testament truths. The Old Testament contains many prophecies that are fulfilled in the New. The Old Testament provides the history of a people; the New Testament focus is on a Person. The Old Testament shows the wrath of God against sin (with glimpses of His grace); the New Testament shows the grace of God toward sinners (with glimpses of His wrath). 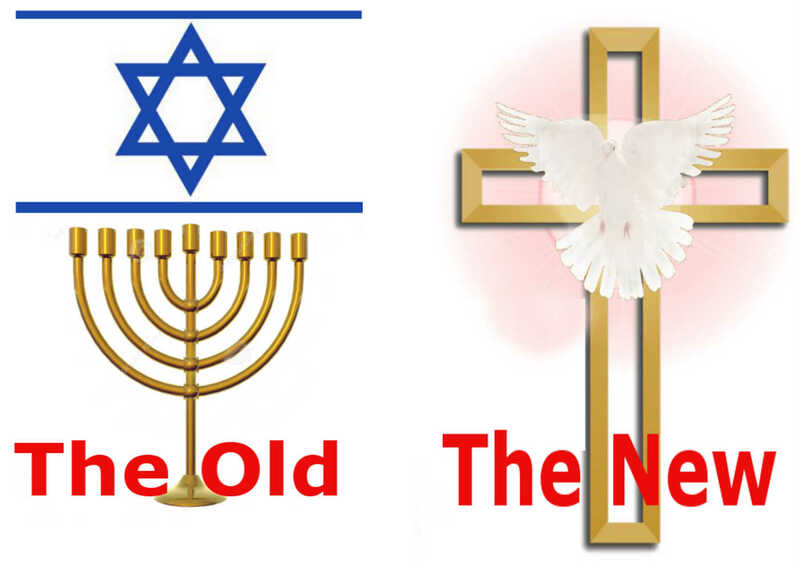 The Old Testament predicts a Messiah (see Isaiah 53), and the New Testament reveals who the Messiah is (John 4:25–26). The Old Testament records the giving of God’s Law, and the New Testament shows how Jesus the Messiah fulfilled that Law (Matthew 5:17; Hebrews 10:9). In the Old Testament, God’s dealings are mainly with His chosen people, the Jews; in the New Testament, God’s dealings are mainly with His church (Matthew 16:18). Physical blessings promised under the Old Covenant (Deuteronomy 29:9) give way to spiritual blessings under the New Covenant (Ephesians 1:3). The Old Testament prophecies related to the coming of Christ, although incredibly detailed, contain a certain amount of ambiguity that is cleared up in the New Testament. For example, the prophet Isaiah spoke of the death of the Messiah (Isaiah 53) and the establishing of the Messiah’s kingdom (Isaiah 26) with no clues concerning the chronology of the two events—no hints that the suffering and the kingdom-building might be separated by millennia. In the New Testament, it becomes clear that the Messiah would have two advents: in the first He suffered and died (and rose again), and in the second He will establish His kingdom. Because God’s revelation in Scripture is progressive, the New Testament brings into sharper focus principles that were introduced in the Old Testament. The book of Hebrews describes how Jesus is the true High Priest and how His one sacrifice replaces all previous sacrifices, which were mere foreshadowings. The Passover lamb of the Old Testament (Ezra 6:20) becomes the Lamb of God in the New Testament (John 1:29). The Old Testament gives the Law. The New Testament clarifies that the Law was meant to show men their need of salvation and was never intended to be the means of salvation (Romans 3:19). The Old Testament saw paradise lost for Adam; the New Testament shows how paradise is regained through the second Adam (Christ). The Old Testament declares that man was separated from God through sin (Genesis 3), and the New Testament declares that man can be restored in his relationship to God (Romans 3—6). The Old Testament predicted the Messiah’s life. The Gospels record Jesus’ life, and the Epistles interpret His life and how we are to respond to all He has done.